Dice and wash the sweet potato. If you don't like the skin, peel it in advance of course. Heat oil in a pan and fry the sweet potato until it gets soft. This will take approximately 20-30 minutes. Instead of frying you can also cook or bake the sweet potato in the oven. Note that all options will take about the same time. While the sweet potato is in the pan mince the garlic and dice the onion and smoked tofu. Once the sweet potato gets softer you can add the other ingredients. Lower the heat before adding the onions, garlic and tofu. Add more oil if necessary. Season with salt and cumin. Chop the spinach roughly and add lastly, once the sweet potato is completely ready. Deglaze with some water. Clean and slice the tomato and arrange with some basil leaves on one side of the plate. Season with pepper and salt. Halve the avocado and scoop it out with a spoon. Cut it into slices and arrange it on the other side of the plate. Season with kala namak. 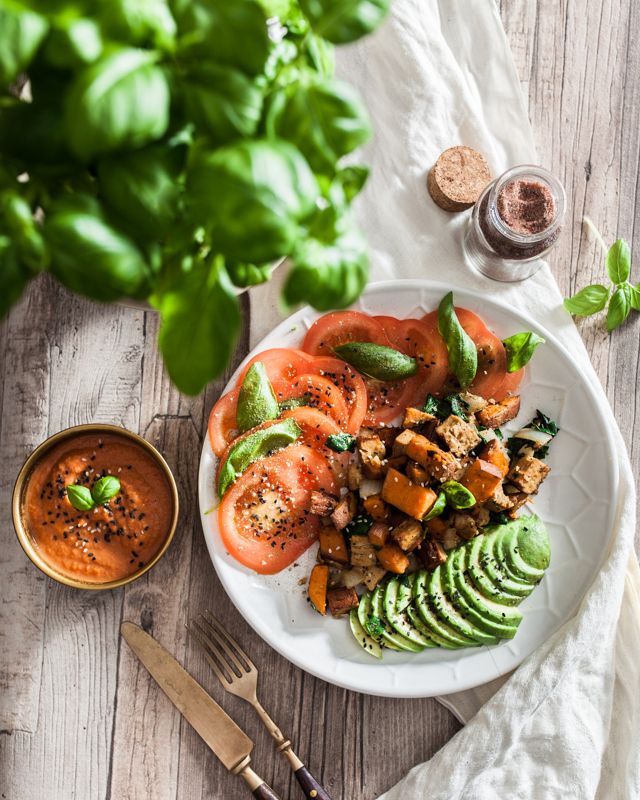 Place the fried sweet potato in the middle of the plate, garnish with basil and sesame seeds and add the ketchup on top. Mince the dates and let them soak in hot, not boiling water for 10 - 15 minutes. Add all the ingredients to a mixer and blend it until you have a smooth and soft mixture. Add water if necessary.